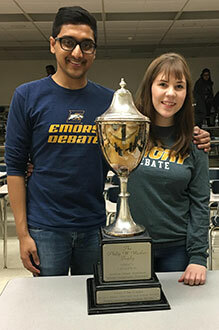 Emory seniors Viveth Karthikeyan and Kristen Lowe won the American Debate Association National Championship on March 13. Viveth Karthikeyan and Kristen Lowe, both seniors at Emory, bested Harvard University’s team to win the American Debate Association National Championship at George Mason University on March 13. The duo was undefeated throughout the tournament as they challenged teams from Harvard University, Michigan State University, Wake Forest University, the University of Georgia and Missouri State University. The team will compete in the high-profile National Debate Tournament in Kansas City March 24­­-27. James Herndon, director of Emory's Barkley Forum for Debate, Deliberation and Dialogue, says he thinks Karthikeyan and Lowe have a strong chance to win. “They’re both ranked in the top 10 in the country. Now they’re seniors and committed to getting it done,” Herndon says. Karthikeyan and Lowe spent their spring breaks last week preparing for the American Debate Association tournament. “We were here on campus every day between 9 a.m. and 7 p.m. during spring break. Winning was a rewarding way to end a week of hard work,” says Lowe, who is majoring in quantitative sciences with a concentration in anthropology. While her tournament debate career will end at the National Debate Tournament later this month, Lowe is a high school debate coach and plans to continue coaching at the high school or college level. “I’ve done debate pretty much my whole life and it’s very important to me. I’d like to stay involved,” says Lowe, who plans to study public health after graduation. Karthikeyan says he also intends to coach debate after graduating and then go on to graduate school and eventually work in the lab using the research skills and work ethic he’s gained from competitive debate. Karthikeyan and Lowe are some of the best debaters to ever represent Emory, says Ed Lee, Barkley Forum executive director.